September 19 is the 262nd day of the year(263rd in leap years) in the Gregorian calendar.There are 103 days remaining until the end of the year. 1995 –The Washington Post and The New York Times publish the Unabomber's manifesto. Flavius Dalmatius, also known as Dalmatius Caesar, was a Caesar (335–337) of the Roman Empire, and member of the Constantinian dynasty. 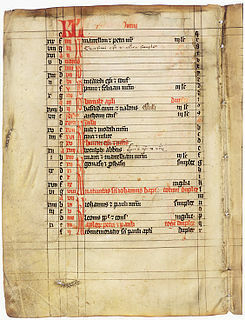 AD 86 (LXXXVI) was a common year starting on Sunday of the Julian calendar. At the time, it was known as the Year of the Consulship of Augustus and Petronianus. The denomination AD 86 for this year has been used since the early medieval period, when the Anno Domini calendar era became the prevalent method in Europe for naming years. Antoninus Pius, also known as Antoninus, was Roman emperor from 138 to 161. He was one of the Five Good Emperors in the Nerva–Antonine dynasty and the Aurelii. Year 643 (DCXLIII) was a common year starting on Wednesday of the Julian calendar. The denomination 643 for this year has been used since the early medieval period, when the Anno Domini calendar era became the prevalent method in Europe for naming years. The Feast of San Gennaro is an Italian-American festival. Originally a one-day religious commemoration, the festival was first celebrated in the United States in September 1926, when immigrants from Naples congregated along Mulberry Street in the Little Italy section of Manhattan in New York City to continue the tradition they had followed in Italy to celebrate Saint Januarius, the Patron Saint of Naples. His feast day is September 19 in the liturgical calendar of the Roman Catholic Church. Our Lady of La Salette is a Marian apparition reported by two children, Maximin Giraud and Mélanie Calvat to have occurred at La Salette-Fallavaux, France, in 1846. Saint Alonso de Orozco Mena was a Spanish Roman Catholic priest from the Augustinian order. He was well known across Spain for his preaching abilities and for an austere and humble life. Januarius, also known as Januarius I of Benevento, was Bishop of Benevento and is a martyr and saint of the Roman Catholic and the Eastern Orthodox Churches. While no contemporary sources on his life are preserved, later sources and legends claim that he died during the Great Persecution which ended with Diocletian's retirement in 305. ↑ "The Assassination of Count Bernadotte". www.jewishvirtuallibrary.org. Retrieved 2018-10-29. ↑ Irene Scaravelli (2002). "Gotofredo". Dizionario Biografico degli Italiani. vol. 58. Retrieved 16 December 2017. ↑ Perrone, Pierre (22 September 2008). "Earl Palmer Obituary". The Guardian . ↑ "Arthur Mitchell, pioneering black ballet dancer, dies at 84". The Associated Press. 2018-09-18. Retrieved 2018-09-22. ↑ "Bunny Carr: Gentle, funny and changed how Ireland communicates". The Irish Times/Life & Style. 2018-09-20. Retrieved 2018-09-22. Wikimedia Commons has media related to September 19 .